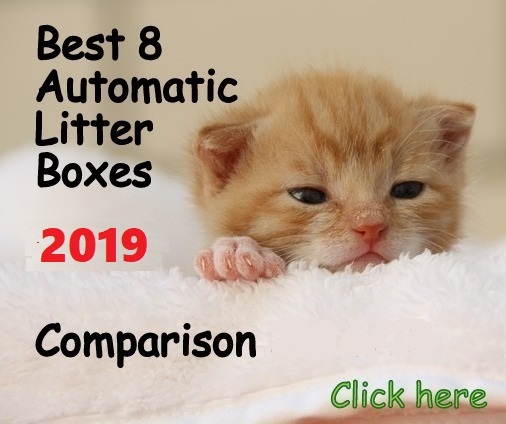 If you are looking for a cat water fountain for your pet here you will find reviews of some popular brands with pros and cons to help you to decide which one is the most suitable for your cat. As all the reviews on this website, they are honest and based in customers experiences. 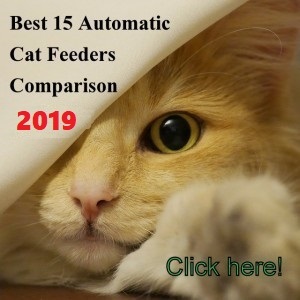 If you don’t want to go through this list of reviews you can jump directly to the best cat drinking fountains and pick one of the best 9. 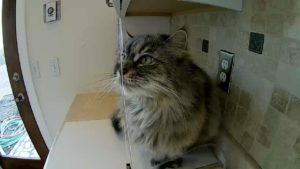 Cats are very versatile animals and the reaction toward any of these devices is unpredictable, but we try to give you an orientation about what unit would work better for your cat. If your cat has already tried a water fountain but insists on drinking water from the faucet or toilet you can check the first two reviews of the Aquapurr, the basic and the newest version with sensor motion and decide which one you prefer. Aquapurr eC is a new design that improves the basic Aquapurr water feeding system. 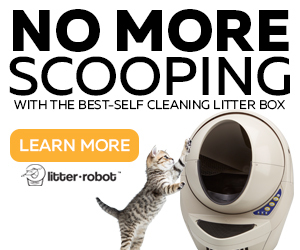 A motion sensor activates when is senses your cat’s body and triggers a stream for your cat to drink. Your pet will have water at all times by only jumping on the sink and stand up close to the base of the Aquapurr eC. This is a great invention that will stop you from having to open and shutting the faucet all the time for your cat, sometimes even at night. Mospro pet water fountain provides your cat fresh and clean circulating and aerated water that will entice your cat to drink more. The design is simple to disassemble and clean. 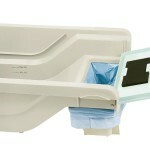 The unit is made of non-toxic thick PP resin that is food-grade certified. The Aquapurr cat water drinking system is specially designed for cats that insist on drinking from faucets and refuse drinking from automatic water fountains. 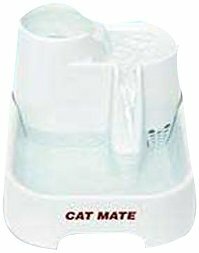 The Cat Mate Pet Fountain is a water dispenser that gives your cat fresh running water to encourage it to drink more water. 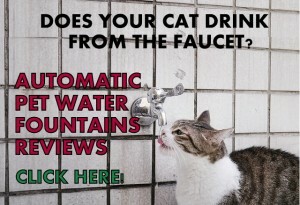 This is good for cats that have kidney condition and for cats in general that don’t like to drink water from regular bowls and instead, they like to drink from faucets. 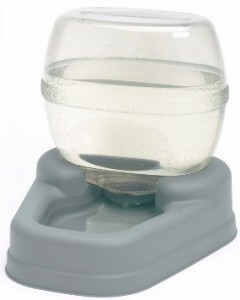 The special design of the Cat Mate fountain makes it a very silent unit and with its unique multi-level water pools makes it more appealing to your cat to drink water since he can choose from the level where to drink. 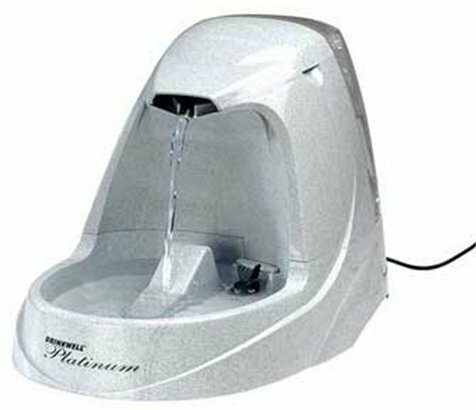 The Drinkwell Platinum is a water pet fountain with a 5-inch free-falling stream water that encourages your cat to drink more water, especially if your pet won’t drink water other than from dripping faucets or bathtub spouts. 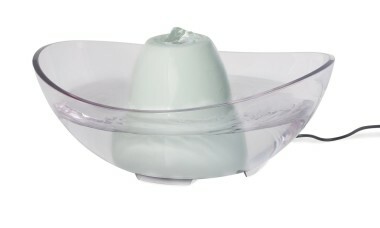 This waterer is made with good durable plastic and holds 168 Oz fluid of water (1.3 gallons or 4.9 L.), including the bowl. 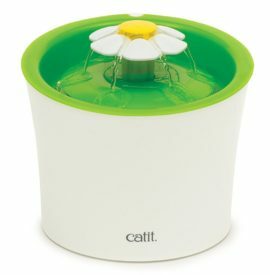 Catit Flower Fountain provides your pet filtered moving water and 3 different flow settings for your cat to drink from. The unit has a good capacity of 100 fl Oz and a unique filtering system that removes the excess of calcium and magnesium to keep your cat’s urinary system healthy. 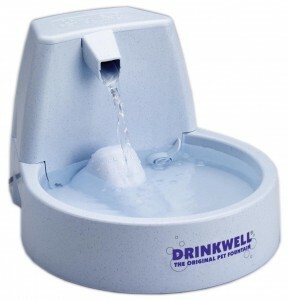 Drinkwell Multi Level Automatic Pet Fountain has a good circulating water system with a nice free-falling stream which makes your cat drink more because cats feel more attracted to moving water making them drink more and keeping them well hydrated. The water is filtered by a replaceable charcoal filter, removing bad tastes and odors for a clean, fresh source of moving water. Drinkwell Multi tier fountain is special for multi-cat households because it gives three areas where to drink: top and bottom tray and the falling stream. Catit Fresh & Clear Stainless Steel keeps your cat hydrated by drinking more water with its re-circulating system that encourages your pet to drink more and keeps the water cool and oxygenated. 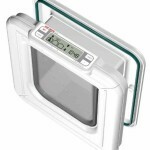 The unit features a dual filter with foam and carbon that filters the water from pet hair. Petsafe Drinkwell Avalon is a very nice looking ceramic fountain that supplies your cat with fresh and aerated filtered water, encouraging your pet to drink more as felines prefer to drink from moving water. Increasing the water intake in pets is very important when it comes to prevent urinary tract diseases. 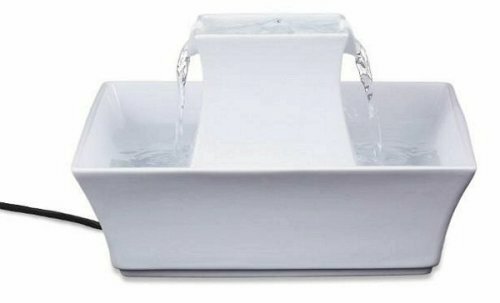 As any ceramic device, this fountain is particularly easy to clean in comparison to plastic units and the ceramic helps to reduce bacteria growth, so the fountain stays clean longer. Catit Fresh drinking fountain holds 100 Oz of water and gives cats a circulating source of fresh and oxygenated water which helps to prevent urinary tract diseases in cats. 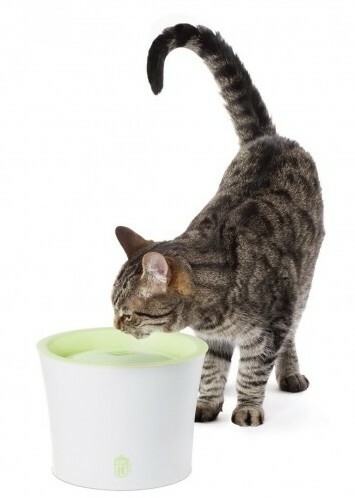 Hagen Catit pet fountain is a tall water bowl designed for your pet to drink without the need of bending over. This elevated design helps to keep the bubbling water away from particles on the floor. The water bubbles up from the centerpiece of the unit where cats drink from. A cartridge filter located underneath the centerpiece of the fountain keeps the water clean and fresh, free of particles and hair. The unit includes one cartridge, extras are sold apart. The Drinkwell 360 fountain entices your cat to drink more water because it makes the drinking more attractive and fun as cats like to drink moving water better than stagnant water. A patented 5-inch free-falling water stream and the round design helps your cat drink water from any angle, so no more waiting its turn for drinking. This feature makes the fountain suitable for multiple pet households. The Drinkwell Zen Steel Fountain has 128 Oz water capacity and a circulating water system that gives your cat oxygenated and fresh water. Moving water entices pets to drink more which is very important to avoid urinary problems. Circulating water also inhibit bacteria growth and slime. The Drinkwell 360 Stainless Steel fountain it is a good solution for pets that are allergic to plastic as they do not have contact with plastic when drinking water from the stainless steel reservoir. With its 128 Oz capacity (1 gal) of fresh and filtered water the Drinkwell stainless steel ensures your pet to drink more water as it gives constant stream of moving water which encourages pets to drink more. The Petsafe Drinkwell Pagoda is a ceramic fountain that encourages your cat to drink more water with its dual free-falling streams that oxygenates the water and keeps it cool and fresh. 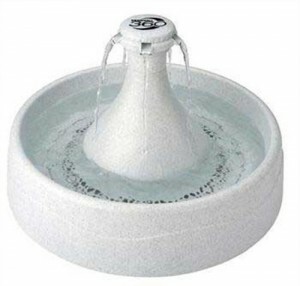 This fountain is perfect for pets with feline acne as does not have plastic in the area where your pet drinks. 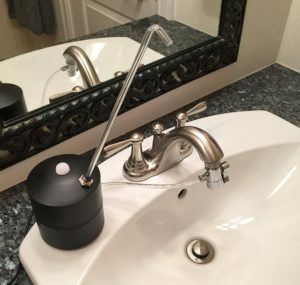 The unit has 70 ounces water capacity and it works with a charcoal filter which removes bad odors and taste. 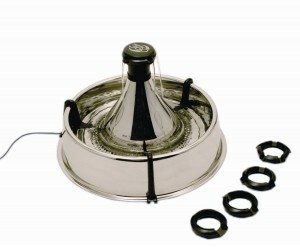 The Petsafe Drinkwell Pagoda comes with one filter for initial set-up. This unit is very easy to clean and has a nice looking design. See pros and cons in the FULL REVIEW. 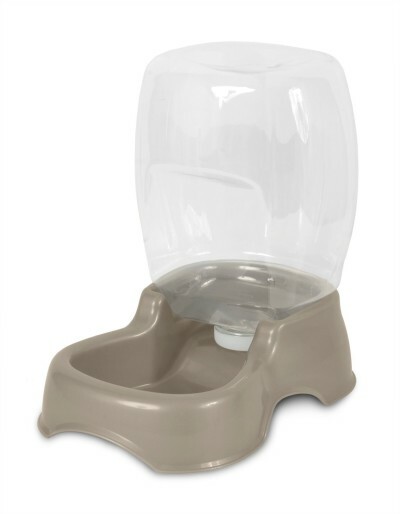 Petsafe Drinkwell Sedona pet fountain provides your cat fresh circulating water to keep your pet hydrated. The unit looks very elegant and stylish, complementing any home décor. The fountain features approx. 100 oz water capacity (check full review) and it’s suitable for small and medium size pets. Petsafe Drinkwell Sedona is made from transparent BPA-free plastic and if features a sturdy ceramic tower in the center where the water runs. 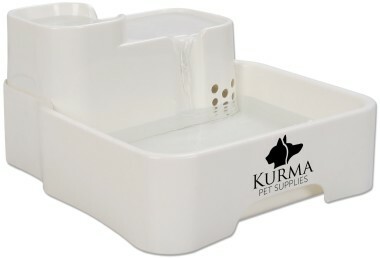 Kurma Best Automatic Pet Water Fountain provides your cat 3 sections from where your pet can drink from, on top left from where the filtered water comes from, the top right that creates a mini waterfall and the low wide bowl that receives the stream. The unit features a 2-step filtering process to filter the water. The fountain is very quiet with a submersible pump featuring a switch on the side that allows you to regulate the stream if small or big, slower or faster. 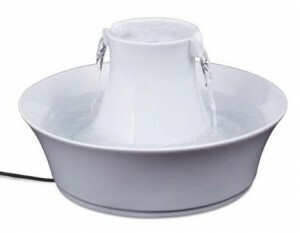 Kurma automatic pet fountain holds a good capacity of 1 Gallon of water, preventing from constant refilling and supplying water for several days. FULL REVIEW. Drinkwell Original Pet Fountain is a cat water dispenser that encourages your pet to drink more water by giving it a permanent source of stream falling of water. Increasing the amount of water your pet drinks helps to reduce the risk of developing urinating problems. 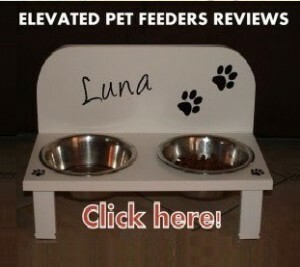 The unit has a 5 inch of free falling stream of water that allows your pet to drink water from any angle. 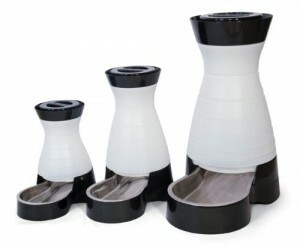 Replaceable charcoal filters help to purify the water and reduce bad taste and odors. Pioneer Ceramic Big Max is a pet fountain with a high water capacity of 128 Oz that ensures circulating water for your pets to drink more. Ceramic is hygienic, easy to clean and it helps to reduce bacteria formation. The Pioneer ceramic is very easy to assemble by putting together two main pieces. This fountain gives cats two areas to drink from: the mini waterfall and the bowl. Pioneer ceramic Big Max has a premium replaceable charcoal filter that helps to keep the water fresh and pure from pet hair and particles. 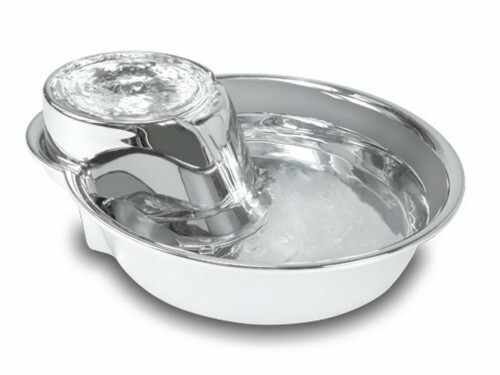 Pioneer Pet Stainless Steel Raindrop is an elegant pet fountain with a water capacity of 60 Oz (1,77 L), which gives cats 2 different areas where to drink water from: the top and the bottom (some cats like to drink and lick the slide too). The fountain has a slide that helps to minimize splash and creates fun bubbling. Moving and circulating water encourage pets to drink more and keep well hydrated and healthy. Pioneer Big Max fountain with 128 Oz (3.78 L) capacity is a stainless steel fountain that keeps the water in movement which encourages your pet to drink more. It consists basically in two main assembled parts; the top and the bottom. The water comes out from the top part so cats have two areas where to drink: top and bottom. Stainless steel keeps the water cool, helps to stop from developing bacteria and it is very easy to clean. Petkit Eversweeet is a cat water fountain that features a triple filter that allows your cat drink fresh and healthy water every day. Petkit Eversweet can be set in 2 modes, Smart Mode or Normal Mode. When set in Smart Mode the fountain distinguishs day from night, adapting the function according to the water intake. Cats usually drink more water in the day and less at night and Petkit pet fountain saves and optimizes the energy adjusting its functionality according to this. The unit has a bowl where your cat can drink water directly from and a dome where the water runs over and where your pet can lick the water from as well. The water capacity of the Catit Design Fresh and Clear drinking fountain is 100 fluid Oz. 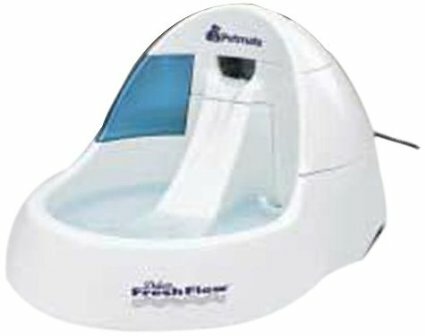 Petmate Fresh Flow Pet Fountain 108 Oz. 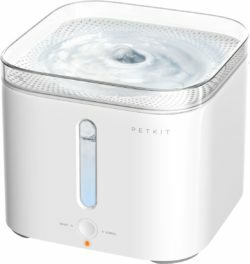 Petmate Fresh Flow Pet Fountain is a quiet fountain that keeps the water oxygenated, cool and fresh making your cat drinking more water as pets like to drink moving water better than stagnant water. 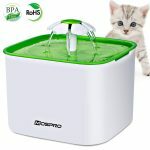 Its design with a water-slide where the little waterfall runs along, helps your cat not to be afraid of getting the face wet when drinking water as the water flow of the Petmate Fresh Flow is small and does not splash over the floor. Petmate Cafe is a fashionable designed gravity waterer that allows you to give a long lasting source of water to your cat without the need of refilling for days. Water consumption is very important to keep your cat hydrated and with good health, especially if you feed your pet dry food. Petmate Cafe waterer hopper has a wide opening, allowing easily to clean with a brush. The unit is easy to refill; fill the hopper with water, put the cap back on, flip it, place it on the bowl and you are ready to go for days. PetSafe Healthy Pet Water Station is a water dispensing system with removable stainless steel bowl, easy to clean and dishwasher safe plus prevents the formation of bacteria. The stainless steel bowl is a good solution if your cat has allergy to plastic. Petsafe Healthy Pet Water Station has a unique flow-control system that prevents the unit from spilling water when filling it from the bottom. You can upside down the unit and the water won’t fall out. The Bergan Petite Gourmet waterer with 1-1/2 gallons capacity is suitable for small pets. 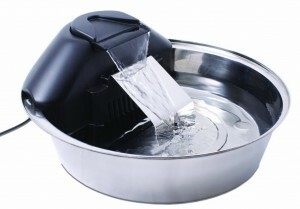 With a transparent holding tank, you can see the water level to know when refill. The holding tank has a detachable cap that won’t release water until the container is locked into the reservoir-base. 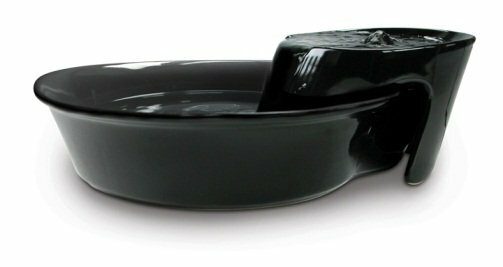 The Bergan Petite Gourmet has wide opening which makes it easy to clean it inside and also to fill it in the sink as the holding tank is wide and short. I am happy I could help you Colm. What’s your cat’s name? Great reviews, Lorena. I have an old family friend who might be interested in these reviewed products. Keep up the great work! Thank you Bill. I like my work a lot and especially to help people not to waste their money. That is my main goal with this website. Tell your friend he can ask any question he might have about these reviews or products. Thank you! I have 8 cats. 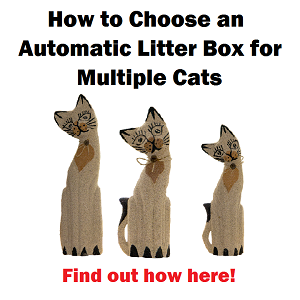 Is there a specific unit you recommend for multiple cats? Hello Naomi, if you want extra water capacity the Bergan Petite Gourmet Waterer water dispenser has a great capacity of 1.5 gallons, but this is not an automatic water fountain, it’s a gravity water feeder. If you want an automatic fountain, the most suitable for multi-cats is the Pioneer Ceramic Drinking Fountain Big Max. You can see a review of this fountain here. should have seen this before I bought a water fountain!! lol I have bought, and will be returning, water foutain called Automatic pet fountain and the pump is too loud and to fill the tank you have to take it off and fill via ahole in base!! thought I was being cute in buying cheaper.. not..
Hello Dmitry, I suggest you to get the PetSafe Drinkwell Ceramic Pagoda Fountain. Its capacity is 70 Oz. and is made from ceramic which makes it easy to wipe clean. Make sure to keep the fountain filled with water to keep it quiet. Good luck! Thanks for this comprehensive information! I was wondering if you knew of any fountains that allow you to control the amount of flow of the falling stream. My cat likes the faucet to just barely trickle, so I’m looking for a fountain that allows me to control the amount of flow. Any ideas? Much appreciated! Hello Kim! I suggest you the Drinkwell 360° Stainless Steel Fountain. It has 3 streams and they are adjustable. You can get a very small stream with this fountain and it’s not made from plastic which is more hygienic. It’s a good water fountain, but to clean it it’s not a breeze. Your page is a live saver ! Thanks for all the information. I was wondering if you know any water fountain that can be attached directly to a tap water so it can always keep the level of the water. Hello Jean, there is a water fountain more suitable for dogs that hooks up to a water line. You can see this product here. Hi Anna! thank you! 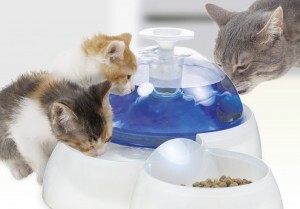 If you have three cats, two big sized and one small I suggest you the Petsafe Drinkwell Ceramic Pagoda or Avalon fountains. This is specially designed for pets that like to drink from faucets or moving water and it encourages pets to drink more. I don’t know if your small cat will get used to drink from a falling stream but she will be able to drink from the bottom which is a little narrow but since she is small it will be fine. You and your cats will need to get used to the splashing noise these fountains make, once that happens, it’s all good. 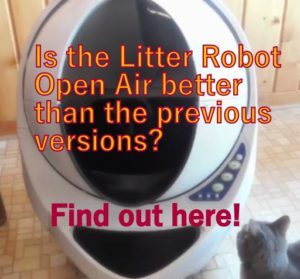 Regarding finding a low-maintenance automatic cat water fountain it would be pretty hard because all these units need some type of maintenance because since they are automatic, they have motor that needs to be cleaned periodically. Hope that helps! Great article very thorough. We decided to get a fountain for our dog and she definitely seems to like drinking from it. It is though very loud and was wondering which was the quietest model available? Many thanks. Hello Mark, the Pioneer Ceramic Drinking Fountain Big Max is pretty quiet. To ensure its quietness you want to keep the unit clean and not letting the water get too low. Ceramic is more hygienic too Good luck! Many thanks for your help! We plan on getting a ceramic fountain. I had decided that the Petsafe Healthy Pet Water Station would be very suitable for my cats needs, especially with the SS dish and the filter system. I tried to buy from Amazon but this product cannot be shipped to Australia. Am very disappointed. Do you know why? And is there anything else similar to this? Hi Elizabeth! I suggest you to contact the manufacturer directly and I am sure they have a way to ship to your country, they usually do. Hope that helps! This is great! Any thoughts on a fountain that won’t become a splash pool? 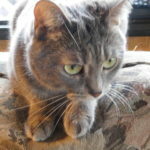 We have the small Petmate Fresh Flow II and one of the cats (ironically the one that only drinks running water) spends hours splashing water out onto the floor. I’m thinking we need one that has good flowing water and a minimal area of still water. Thanks! Hi Michele! you can check the review of the Hagen Catit or similar models. The water is underneath the lid so there is not still water to play with. Hope that helps! Hi Lorena, thanks so much for all your wonderful reviews. My naughty little cat splashes all the water out of her bowls and flips them over. Is there any point trying a fountain and which would you recommend? I’m at my wits end! Thanks again! Hi Jess, I suggest you the Petsafe Drinkwell Pagoda or Avalon because they are sturdy and hygienic, they are made from ceramic which prevents chin acne. Hope that helps! Hi Jess! I rescued Samantha from the pound in November of 2014. She was 6 at the time and I had no information about what her past life was like. Like yours, she had a habit of pushing her water dish around the kitchen, very nicely spilling all the water out of it. I bought the Drinkwell Original Pet Fountain and it was the answer to a prayer. She loves it! Cleaning it was a chore in trying to take apart the motor until I switched to a tool I use to take apart cell phones (which also can be stubborn to disassemble) to repair. Once that problem was resolved, it was easy! Good luck to you! 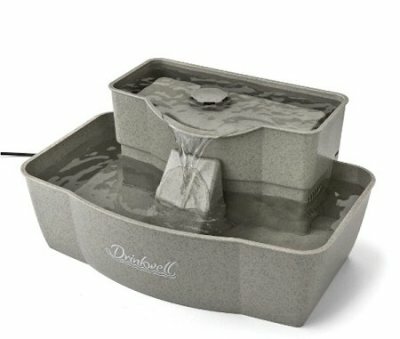 Hi – Thanks for all the information :) have you reviewed or do you have any comments on the Drinkwell Sedona Fountain-Lake Breeze? Hi Karen, I haven’t made a review of that item yet but I will soon this week. Thanks for visiting! Is there a water fountain that is motion activated or something instead of running all the time? Hi Kevin, I haven’t come across to something like that yet. You can connect a water fountain to a timer as an alternative. Check out my AquaPurr. It never needs cleaning or refilling! I will Steven! Would you send me your email? Is there a smaller fountain for one cat that will not cause feline acne? The Catit Fresh and Clean has a stainless steel cover and measures 6.8″ tall by 8.5″ wide. Is this fountain also hypoallergenic? 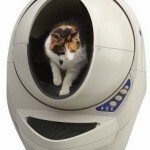 I need one that will not cause feline acne or allergies in cats. The top is made from stainless steel so I won’t cause chin allergy to your cat. Feline acne is caused by direct contact with plastic. I’m looking for a fountain for two cats, that can hold enough water for them both when we’re gone for 5 days. Priorities: 1) quiet, 2) easy care, 3) attractive (I like the look of the ceramic ones, but wonder if they hold enough water and also concerned about noisiness). Hi Alexis, pretty much all cat water fountains need to be cleaned often to prevent bacteria growth, plastic even more often. The Drinkwell Multi-tier fountain has a good capacity but it’s noisy. I would recommend you the Drinkwell Platinum for your cats, it’s a good water fountain and it looks nice (although clean it could be a pain). If you are going to leave your 2 cats for 5 days make sure to place an extra water bowl, just to be safe in case of any power outage. My 2 cats love their water fountain. The issue I have had with 2 x Catit water fountains and 1 x Cat Mate fountain is the fountain pump gives out quickly. The most recent one was with my Cat Mate fountain purchased January this year. The pump has just recently stopped working. Can you recommend a fountain that has a sturdier, longer life pump? Hello Viv, more than a fountain with a long life pump maybe you should look for a fountain that offers pumps as spare. Most pet water fountains have pumps that give up after a while. 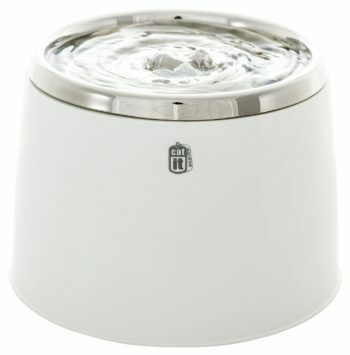 Good quality fountains are the Drinkwell Platinum and the PetSafe Drinkwell Avalon which is a ceramic fountain. A good advice to keep the pump working is taking apart the pump (outside cover piece, then the piece over the impeller and removed the impeller too), and flushing/cleaning of the parts and the overall pump. Then spray a small amount of (organic) food-safe canola oil cooking spray on the impeller. Put the pump back together and it will work. 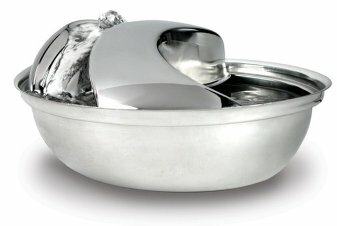 What can you tell me about the Aqua Stream Stainless Steam Pet Fountain? Hi Cindy! I haven’t done a review of that fountain yet but I will. Thanks for your comment. Thank you for giving us useful information to buy pet water fountain.